All transactions are safe and secure with a reliable history in online purchasing behind each of our associates. 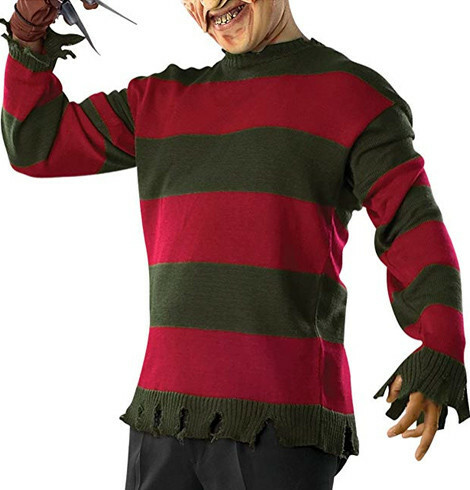 Buy the Chest of Souls Freddy Krueger Sweater to own Nightmare on Elm Street clothing and merchandise. Perhaps the most recognizable of all of the killer's accessories other than his knived fingers, this Nightmare on Elm Street sweater will keep you warm on chilly Halloween nights when you're not hanging out in the boiler room. Diehard fans might notice that the stripes are flipped on this officially licensed item. The real krueger sweater from the movies has red as the first color at the neck. In addition to the Chest of Souls Freddy Krueger Sweater above, browse the Nightmare on Elm Street Clothing Gallery for more apparel like men's and women's clothes, kids shirts or hoodies.